Transparency Market Research (TMR) has published a new report titled, “Chronic Obstructive Pulmonary Disease (COPD) Treatment Market - Global Industry Analysis, Size, Share, Growth, Trends, and Forecast, 2018–2026”. 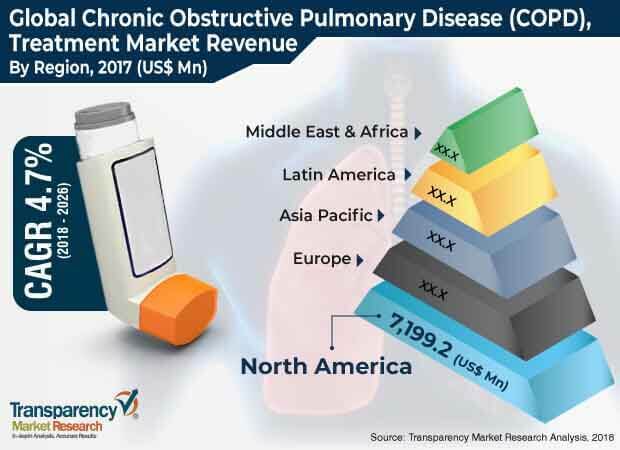 According to the report, the global chronic obstructive pulmonary disease treatment market was valued at US$ 16,623.9 Mn in 2017 and is anticipated expand at a CAGR of 4.7% from 2018 to 2026. High prevalence of COPD, promising drugs in pipeline, growth of the pharmaceutical industry in emerging markets such as Asia Pacific, and launch of products such as inhalers are projected to augment the global market from 2018 to 2026. COPD is a common respiratory disease characterized by inflammation of the airways, which results in difficulty in breathing. The disease affects adults, children, and the geriatric population across the globe. According to the Global Burden of Disease Study (in 2016), 251 million cases of COPD were reported across the world and the disease led to 3.17 million deaths in 2015, with 90% deaths in low­ and middle-income countries. A number of market players have received approvals from the Food and Drug Administration (FDA), the European Commission, and other regulatory authorities in the past few years. These players have launched new products such as triple therapy drugs and other combinations in the market, enabling them to gain significant market share. In December 2018, AstraZeneca received approval from the European Commission (EC) for Bevespi Aerosphere in a pressurized metered-dose inhaler (pMDI) indicated as a maintenance dual bronchodilator treatment in adult patients with COPD. This approval enabled the company to add its technologically advanced product to the existing product offering for patients in Europe. In December 2018, Teva Pharmaceutical Industries Ltd. received the U.S. Food and Drug Administration (FDA) approval for ProAir Digihaler inhalation powder, a digital inhaler with built-in sensors connoted to a companion mobile application. This approval helped the company to strengthen its innovation capabilities in respiratory care, thereby achieving significant growth in the market. In terms of revenue, the chronic obstructive pulmonary disease treatment market in Asia Pacific is projected to expand at a CAGR of 5.3% during the forecast period. High prevalence of COPD, increase in the geriatric population, and rise in addiction to smoking are anticipated to boost demand for COPD treatment, which in turn is expected to drive the market from 2018 to 2026. Japan has the world’s largest geriatric population, with 33% of the population aged 60 years or above in 2015. Government initiatives to reduce the number of delayed diagnosis and improve access to medications in the region are anticipated to boost market growth in the next few years. The report also provides profiles of leading players operating in the global chronic obstructive pulmonary disease (COPD) treatment market. These include AstraZeneca, Boehringer Ingelheim Pharmaceuticals, Inc., GlaxoSmithKline plc, Novartis AG, CHIESI Farmaceutici S.p.A., Sunovion Pharmaceuticals, Inc., Teva Pharmaceutical Industries Ltd, Mylan N.V., and Orion Corporation. Strategic collaboration between companies and government organizations and mergers & acquisitions for the development of new therapeutics are expected to drive the global market during the forecast period. In March 2017, AstraZeneca entered into a strategic collaboration with Circassia Pharmaceuticals plc for the development and commercialization of Tudorza and Duaklir, inhaled medications for the COPD treatment, in the US. According to the terms of the collaboration, Circassia Pharmaceuticals plc has been granted marketing rights to Duaklir in the U.S. In February 2017, Boehringer Ingelheim International GmbH entered into a collaboration with Weill Cornell Medicine to determine new treatment approaches for COPD. The collaboration was aimed at developing novel treatment options which could stop or reverse the progression of the disease process. In February 2015, Mylan, Inc. and Theravance Biopharma, Inc. entered into a partnership for the development and commercialization of TD-4208, an investigational once-daily nebulized long-acting muscarinic antagonist (LAMA) for COPD and other respiratory diseases. In December 2016, Sunovion Pharmaceuticals, Inc. entered into license agreement with Novartis for the commercialization rights to TIBRON NEOHALER, Arcapta Neohaler, and SEEBRI NEOHALER in the U.S. This helped the company to expand the COPD portfolio and strengthen its pharmaceutical business in the country.